Holigost was rebuilt from a captured Spanish ship and named to reflect Henry V's personal devotion to the Holy Trinity. A timber vessel believed to be one of Henry V's "great ships" has been found in a river in southern England, heritage group Historic England has announced. Experts from Historic England believe the wreck that lies buried in mud in the River Hamble near Southampton is the Holigost (Holy Ghost). A major part of Henry V's war machine, the ship played a key role in two sea battles that enabled him to conquer territory in France in the early 15th century. "To investigate a ship from this period is immensely exciting," said Duncan Wilson, chief executive of Historic England. "It holds the possibility of fascinating revelations in the months and years to come." The announcement comes two weeks before events to mark the 600th anniversary of the Battle of Agincourt. On October 25, 1415, Henry led his troops to a major English victory in the Hundred Years' War near what is now called Azincourt in northern France, a battle immortalised by William Shakespeare in Henry V.
The 600-year old ship was discovered next to the king's flagship, the Grace Dieu — itself found in the 1930s — by historian Ian Friel after examining aerial photographs of the "medieval breaker's yard". "There is the real possibility that the remains of this ship still survive in the River Hamble," he told BBC Radio 4. Historic England will conduct a sonar survey and timber sampling "to confirm or not if it's the Holigost", he added. The Holigost joined the royal fleet on November 17, 1415 and suffered serious damage at the Battle of Harfleur in 1416. It was rebuilt from a captured Spanish ship, the Santa Clara, and was named to reflect Henry V's personal devotion to the Holy Trinity. It was deliberately docked after 11 years of service having sprung several leaks, according to Mr Friel. One of Henry VIII's warships, the Mary Rose, which sank in 1545, was salvaged in 1982 in a feat of maritime archaeology that provided a wealth of detail about life in Tudor times. The ship is due to be displayed dry in the Mary Rose Museum in Portsmouth after painstaking and expensive conservation work to preserve its timber hull. With the three Punic wars (264-241, 218-202 and 148-146 BC) Rome and Carthage became locked into a Hundred Years War. Control of the Mediterranean at once became the issue in a contest which would end only with the death of one of the adversaries. When Rome took Rhegium in 270, the Carthaginians placed a garrison across the water in Messina. The two political monsters – on one hand Italy, united from the Po valley to the Gulf of Tarentum; on the other North Africa, from northern Cyrenaica to present-day Morocco, backed up by southern Spain – eyed each other across the narrow straits. They were well-matched adversaries, capable in fact of coming to terms, as earlier treaties had demonstrated. It would, moreover, be inaccurate to describe their confrontation as one between a sort of gadfly (Carthage, the maritime power) and the heavy-footed soldier (the Roman legions). Carthage was no less expert than Rome at building roads and bridges, and its agriculture was well developed, while Rome had been interested in the Mediterranean since well before 264 b c. It had had dealings with the cities of Greater Greece, and merchant shipping was active along Italian coasts. As for Rome’s fleet, the normal components, triremes and quinqueremes, long vessels with three or five stepped rows of oarsmen, took only a short time to build. In 260, at the outset of the wars, Rome launched a fleet of 100 quinqueremes and thirty triremes, plus some other ships, all in the space of sixty days; in 254, the Romans launched 220 vessels in six months. We need not take these figures quite literally perhaps, but the ships were certainly assembled very rapidly, probably too quickly for their quality not to suffer, as had already been the case in Greece. As a result, these navies did not last long, sometimes only the space of a single campaign. Early in the war, some sources report, the Italian shipyards had copied a Carthaginian quinquereme which had fallen into Roman hands. That is not impossible. 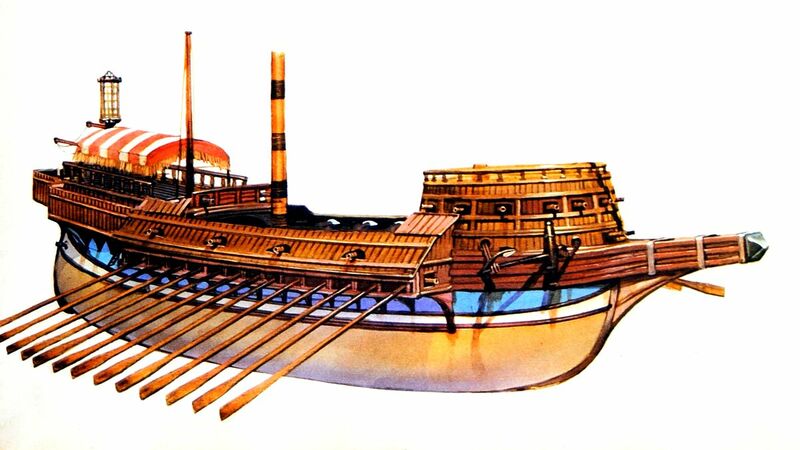 The quinquereme was a monstrous ship, developed in Cyprus or Phoenicia before Alexander’s campaigns. Of the western Greek cities, only Syracuse had built quinqueremes. But it was child’s play to copy the design. Supplies of timber were no problem for Rome: the peninsula still had many forests. The Greeks in the Gulf of Tarentum had timber for boatbuilding delivered from the Sila massif in Bruttium. The Romans had it floated down the Tiber to Ostia. In this respect, Carthage was at a disadvantage, since it had to look to Sardinia for timber supplies. These longships might be easy to build but they were costly to operate, particularly since they could be used only on calm summer seas and over short distances, such as between Italy, Sicily, Malta, the Lipari Islands, the Egadi Islands and the nearest points on the North African coast. What was more, they required huge numbers of men: sailors, oarsmen, soldiers – as many as four hundred in each ship, according to Polybius. Overall, this was an extraordinarily expensive war: with both sides equally committed, it was bound to become a matter of attrition. In 264 BC, Rome had effortlessly occupied Messina, having been called upon by the then rulers of the city, the Mamertines, a rather remarkable band of adventurers who had betrayed the Carthaginian garrison. After imposing a peace settlement on Hieron of Syracuse, the Romans began the siege of the western cities: Agrigentum fell during the winter of 263-262, and 25,000 captives were sold into slavery. In 254, almost ten years later, it was the turn of Panormus (Palermo), another Carthaginian stronghold: here 10,000 of the inhabitants were reduced to slavery. At sea, in 260, one Roman fleet was defeated off the Lipari Islands, but a second one, under the command of the consul C. Duilius Nepos, was victorious off Mylae (Milazzo), thanks to the grappling irons and boarding planks which the Roman sailors used against the enemy. The Carthaginian vessels, which were easier to manoeuvre, were thus cheated of their advantage and boarded by force: the naval battle became hand-to-hand combat, just as if it were being fought on land (and this was to be the rule for centuries to come, in encounters between galleys). From now on, Rome felt sufficiently confident to confront Carthaginian vessels along the African coast. In 256, an expeditionary force was landed on Cape Bon. It wintered in Tunis, but was crushed the following year: the unfortunate commander was the consul Atilius Regulus. The tide did not yet turn in Carthage’s favour. However, the city had found in Hamilcar Barca a commander of genius, who had dug himself in on two fortified and impregnable mountain tops in Sicily: Mount Heircte, near Palermo and Mount Eryx near Drepanon (Trapani). His troops launched raid after raid, and the Punic ships also engaged in some fruitful piracy. This low-key war worked against Rome’s interests. The Republic lost 700 ships to storms, pirates and the enemy navy. Carthage now launched a massive fleet, but Romans and Greeks combined in a stupendous effort and crushed it in 240 off the Aegates Insulae (Egadi), off the western tip of Sicily. The disaster brought Hanno and the peace party to power in Carthage. Rome was able to impose draconian peace terms. Sicily was now in Roman hands and Rome took immediate advantage of Carthage’s grave internal problems to lay hands on Sardinia and Corsica. Weakened by an uprising in Libya and a savage revolt by its own mercenaries (who were owed large sums in back pay), Carthage was obliged to accept Rome’s conditions; it managed to retain the rights only to levy soldiers and load grain in Italy. After the Sicilian disaster, however, and the crushing of the mercenaries’ revolt in 238, Hamilcar Barca had gone to Spain with the remnants of his army in 237. Thus began the conquest of Spain, effected by the powerful and proud Barca dynasty. The operation meant capturing the Guadalquivir valley and the high plain of Castulo, forcing a passage to the Mediterranean (the later route of the Via Augusta) and establishing a stronghold in eastern Spain where New Carthage (Cartagena) was founded by Hamilcar’s son-in-law, Hasdrubal. In c. 225, Rome made the Carthaginians promise not to cross the Ebro or disturb the Roman colonies which had been settled from Marseille along what is now the littoral of Catalonia. But the occupation of the Iberian peninsula along its two major axes, the Guadalquivir and the eastern seaboard, gave Carthage direct access to the precious Spanish silver mines and the possibility of cornering their production. A few years later the mint in Cartagena was turning out 300 silver pounds a day. In Carthage itself, beautiful coins stamped with fine images of animals – horses and elephants – testify to this age of prosperity. Hamilcar had, however, been killed in 231, in an encounter with local forces. Ten years later Hasdrubal was assassinated. His nephew Hannibal, son of Hamilcar, was acclaimed commander of the army: a breathtaking career was about to begin. Neither Rome nor Carthage had in fact abandoned the struggle. Each side spied on the other, fearing its might. Rome had to deal with severe unrest in Sardinia and Corsica, where the local tribes were as recalcitrant as the Samnites. There was an even graver threat in northern Italy, where, after some inconclusive campaigning, Rome had struck at the Gauls in 225. Six years later, the Latin colonies of Piacenza and Cremona were founded, but these were fragile outposts. The colonies themselves provoked the uprising of the Boii. And all the while, war was once more brewing between Rome and Carthage. Which would strike first? Hannibal, who had taken Saguntum and crossed the Ebro in April 218? Or the Roman fleet stationed at Lilybaeum, which, after a preemptive occupation of Malta, was preparing to sail to Africa? In September 218, Hannibal crossed the Alps – his exact route is still unknown – and descended with fewer than 30,000 men into the Po Valley. In December that year, he was victorious in the battle of the Ticino. In January 217, on a snowy day, he triumphed at Trebbia; on 23 June, he crushed a Roman army at Lake Trasimene in Etruria. Then, although delayed by the tactics of the dictator Fabius Cunctator, he had the good fortune to win his greatest victory yet, at the battle of Cannae on 2 August 216. But for reasons that remain obscure (not enough men, not enough siege equipment?) he failed to march on Rome, lingering among the fleshpots of Capua, that other Rome, which had ‘abandoned itself’ to him. The following years brought him some successes (he held Tarentum from 213 to 209), but once hemmed in in southern Italy, he was not well supported by Carthage. The defeat on the banks of the Metaurus in 207 of his brother Hasdrubal, who was bringing substantial reinforcements from Spain, sealed his fate. Taking refuge in Bruttium (Upper Calabria) he remained there for years, his escape route cut off by Roman legions, just as his father had been cornered on the slopes of Mount Eryx. Rome meanwhile struck a series of telling blows: Cartagena was taken in 209 and Scipio landed in Africa. Hannibal was recalled and the battle of Zama (202) finally marked the end of the second Punic war. A floating fortress, the galleass was the ultimate and unwieldy result of an effort to combine both oars and broadside, taxing human muscle to the limit. Heavy cannon and high bulwarks made them dangerous attackers - and also impossible targets, for if they could not run down an enemy, they had little need to run away from one. If the siphon itself had perished with the fall of Byzantine Empire in 1453, other incendiary weapons had not. Both sides had men trained to throw clay pots filled with flaming oil, animal fat or quick lime to set the enemy decks ablaze or render them perilously slippery. Arms and cannon threw hollow iron balls filled with burning matter onto enemy vessels, and the flaming shower of sparks from the bomba marked the efforts of the Spanish vessels. The galleasses used their oars to wear ship as required to bring their stern, broadside or bow guns to bear on the targets offered, while the great height of their wooden sides rendered them practically immune to Turkish efforts to board them. The goal of both fleets was to envelop the other, and fierce fighting raged on the flanks of each line. Gunpowder and thick armour began to make a difference in the Christians’ favour. As the Turkish marines perished, another calamity befell their ships. The Christian slaves on the benches of the Turkish fleet began availing themselves of weapons dropped in the carnage and attacking their former masters. While the ships were so embroiled, they lost all propulsion and hope of manoeuvre or escape. Still the Turks fought on. Ali Pasha’s command squadron forced its way through to a cluster of Christian flagships in the centre of Don Juan’s line. Even the commanders became involved in the fighting: a septuagenarian Venetian nobleman too weak to span his own crossbow picked off individual Turks from the masthead while Ali Pasha himself bent a bow in the final surge of the fighting. Faced with the very real threat of destruction in the forthcoming battle, the Venetian Republic added a new and innovative element to their preparations. By one recounting, six of the largest merchant galleys in the Venetian state-operated fleet stood by in one of the Arsenal’s storage basins while the preparations for the impending battle reached a fever pitch. It occurred to some inspired soul that these huge vessels could be used to carry freight rather more lethal than their usual cargoes of silks and spices. No other shipyard in the world could have effected so sudden and drastic a conversion. The traditional emphasis on bow armament shifted under the pressure of necessity. 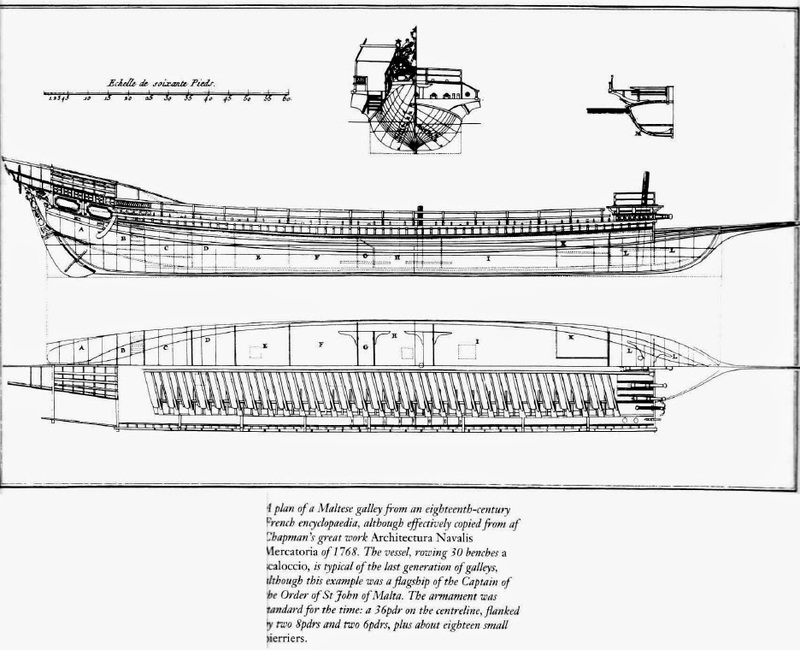 Workman equipped the six galeazas (large galleys), with specialized fighting structures at the bow, the stern and along the sides to hold the largest cannon available from the Republic’s stockpiles. The resulting ‘galleass’ was quite literally a castle on the sea. At the bows of the ships, the high, protected forecastles bristled with cannon. These were balanced by similar armament in the substantial aftercastles. Nine or so periers, or full cannon, jutted out along each side - the guns and their carriages were mounted above, below or even among the oarsmen. On a lighter galley meant for speed and manoeuvre, such weaponry could never have been accommodated. With the creation of the galleass, however, the broadside was born. Our detailed knowledge of the construction of the galleasses comes from specifications for later versions of these formidable hybrids. These were 49m (160ft) long and 12m (40ft) wide - twice as wide as the lighter galleys. Six men pulled each of the 76 heavy oars, and the decks were protected from boarding by the high freeboard, the long distance from the water to her deck being a difficult obstacle for an attacker to surmount. A galleass’s battery probably contained five or so full cannon firing a ball weighing 501b (22.7kg); two or three 251b (11.3kg) balls; 23 lighter pieces of various sizes and shapes; and around 20 rail-mounted swivel guns, used to slaughter rowers and boarding parties. The heaviest Venetian galleasses could fire some 3251b (147.4kg) of shot in every salvo. Five standard galleys would have been required to carry a similar armament. The new leviathans did require towing by their smaller counterparts to achieve any sort of speed of manoeuvre - but this was no problem in a large fleet of galleys; the wind could provide the same impetus it gave to Edward III’s cogs at Sluys. Certainly on later examples, three huge lateen sails, each on its own mast, loomed above the deck. The exact size and armament of the six prototype galleasses at Lepanto is not known, but their performance is well documented. The Venetians were about to surprise the Turks. The profession of designing craft for use on or in the water. The high art of ship design, known as naval architecture, emerged during the Renaissance and the Age of Enlightenment. The growth of naval architecture marked a departure from the craft tradition of ship design. It resulted in applying abstract mathematics to ship design, drafting designs on paper, and, overall, taking a more rational approach to design. From ancient times to the Renaissance, one tradition of ship design existed. In this folk art the master shipwright controlled most of the production process, from selecting the trees for ship timber to launching the completed vessel. Design formed only one of the facets of this craft. It required practical experience, a sense of aesthetics, and an eye for hydrodynamic lines. 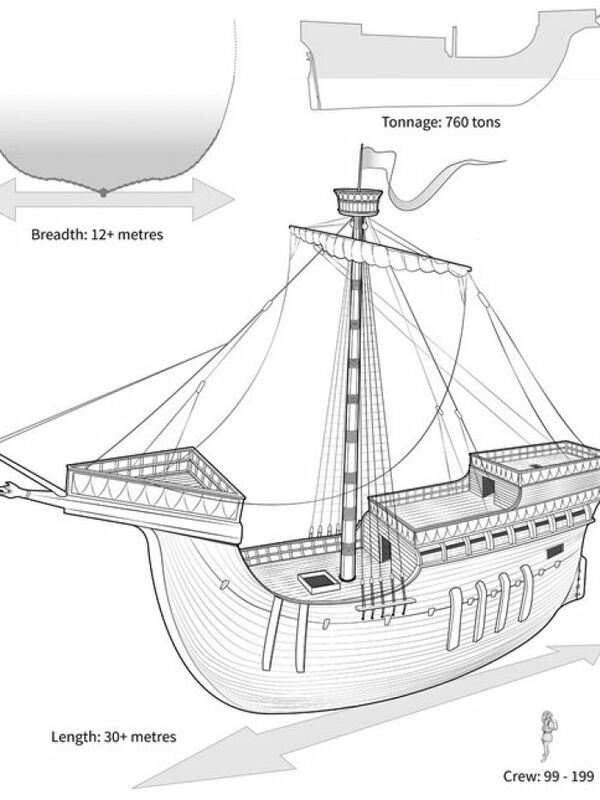 Some of the earliest ship designers modeled their vessels on seaworthy examples. At first they based their designs on natural forms, such as fish and the underwater lines of waterfowl. The phrase used to describe a ship with a bluff bow and fine stern, “cod’s head and mackerel’s tail,” stems from this design tradition. As certain wooden ships became known for their seaworthiness, shipwrights copied their lines for new vessels. It is, therefore, not extraordinary that ships from various parts of medieval Europe could fall within general classifications, such as the cog. This craft-based form of ship design prevailed in some countries well into the nineteenth century. Throughout its history, naval architecture has been closely tied to governmental shipbuilding programs because the development of new design methods and supporting institutions requires a significant financial investment. Venetian shipbuilders were the first to try to replace craft-based design methods with theoretical ones. By the early–fifteenth century, they had elevated galley design to its zenith. To help preserve their superior designs, the Venetians developed a formulaic method requiring only the dimensions of the keel, stem, stern, and midship section. Using this sesto e partixon system, they could extrapolate the rest of the hull lines from these few basic proportions. The Venetians became adept at drawing and preserved some of their designs on paper. They recorded their mathematical methods in the first treatises concerning shipbuilding. Beginning in the mid- to late–fifteenth century, Venetian shipbuilders wrote and reproduced by hand several of these treatises. Shipbuilders in other seafaring countries began to develop sophisticated methods of their own. In the sixteenth century, Spanish shipbuilder Diego Garcia de Palacio published the book Instrucción náutica para navegar. Palacio’s treatise represents the first shipbuilding publication printed in large quantities. This early European movement to develop theoretical ship design methods and preserve them in books departed from the craft tradition of design. Training new generations of master craftworkers had rested on the foundation of apprenticeship and hands-on experience, not book learning. 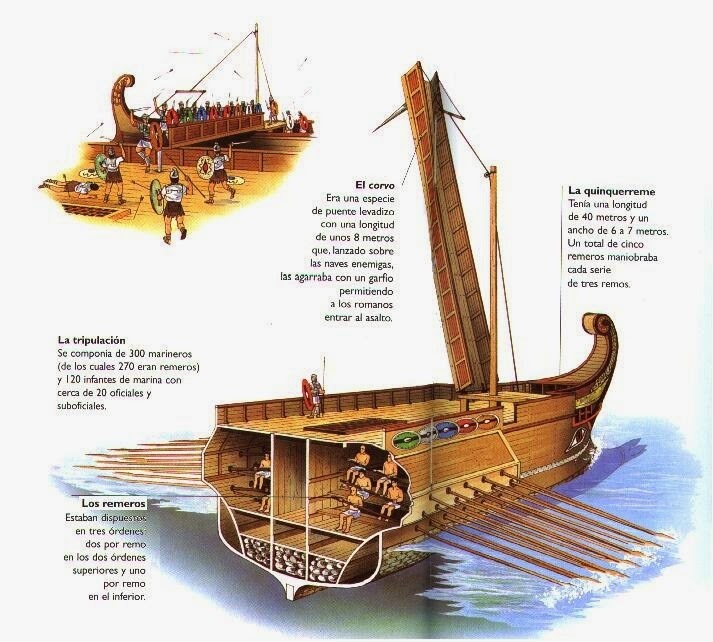 The Venetians and Spaniards began a process that led to the separation of ship design from ship construction. By the seventeenth century, France vied with Spain, England, and the Netherlands for control of the seas. King Louis XIV hungered for maritime commerce and naval power, and his finance minister and minister of the navy Jean Baptiste Colbert did his best to satisfy those desires. From 1661 until his death, in 1683, Colbert increased the size and number of French warships, improved training of naval officers, and ordered numerous charts prepared for better navigation. In 1666, he founded the Académie des Sciences, which became a forum for scientific matters, including navigation and ship design. 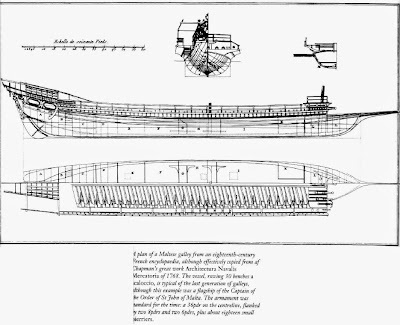 In 1680 Colbert brought together prominent French shipbuilders to determine the best way to maximize speed, maneuverability, and gun positioning on board men-of-war. This group established standard dimensions for each class of warship and eliminated many of the rule-of-thumb methods practiced by private contractors. During the 1700s Colbert’s campaign to promote navigation and shipbuilding bore fruit in the form of design research. French experimenters pioneered the use of model ship basins to test the performance of ship forms. In addition, the Académie awarded prizes for research on ship design subjects, such as the best method for diminishing the rolling and pitching of vessels or propelling a vessel without the use of sails. French works on naval architecture became recognized as the world’s leading ship design treatises. Paul Hoste, a Jesuit professor at the Toulon Naval Academy, wrote Théorie de la construction des vaisseaux in 1697. His treatise laid the foundation for later works on naval architecture by employing the principles of statics and mechanics. In 1746 Pierre Bouguer completed his influential work, Traité du navire. Bouguer devised the trapezoidal rule for the mensuration of areas, which became the basis for many of the hydrostatic calculations that enter into modern naval architecture. In 1752, naval architect and instructor Duhamel du Monceau published Elémens de l’architecture navale. Monceau’s book became widely recognized as one of the eighteenth century’s best naval architecture treatises and was translated into Dutch, German, and English. The French were the first to establish educational institutions to support the profession of naval architecture. During his administration, Colbert had founded schools of naval construction at the Brest and Rochefort navy yards. These schools began the process of separating ship designers from shipwrights and transforming naval architecture into a form of engineering. In 1765, the French continued this process by founding the École d’Application du Génie Maritime to train its naval constructors. This school was the first to educate its students in the science of ship design. British interest in naval architecture lagged behind that of the French. The British always had a reputation as some of the best shipwrights in Europe, and a number of English master builders, such as Phineas Pett and Anthony Deane, distinguished themselves as warship designers. Britain’s movement to rationalize the craft of shipbuilding might not have begun, however, had it not been for that nation’s dependence on overseas commerce and the influence of the Royal Navy. During the eighteenth and nineteenth centuries, Great Britain had to control the ocean lifelines that provided for its economy and support a powerful navy to protect those vital supply lines. The British began to adopt the methods and institutions of naval architecture during the Napoléonic Wars. Fearing that the superiority of French warship designs might tip the balance of power in favor of their naval rivals, British shipbuilders and naval personnel focused their attention on warship design. Some of Britain’s most accomplished mathematicians perfected naval architecture theory beyond the principles advanced by the French. In the 1790s Colonel Mark Beaufoy undertook a five-year study of the resistance of various wooden shapes to water. Beaufoy’s tests represented the first serious British attempt to understand the resistance of hydrodynamic forms to water. Beaufoy also took a leading role in forming the Society for the Improvement of Naval Architecture in 1796. It comprised civilians and naval personnel who supported the study of ship design and construction. Royal dockyard officials Samuel Bentham and Robert Seppings made their greatest contributions to warship construction methods during this period. One of Bentham’s many initiatives led to the founding of dockyard schools for the Royal Navy’s shipwrights.